Why use Viking mounted points? Significantly smoother surface after high gloss polishing compared to use of polishing diamond in the initial step. Saves time in high gloss polishing process. 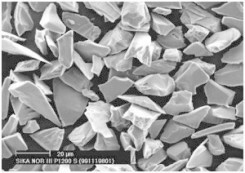 The mounted point consists of many layers of Siliciumcarbide grits which are ceramically bonded together. As a particular grit is worn it will release and reveal a new sharp grit. As the grits themselves brake they will also leave sharp edges (as illustrated by the picture below). This is where the embrittlement of the Siliciumcarbide plays an important role in order to achieve the right quality for dental purposes. In conclusion this means that the mounted point is homogenous and its user is consistently working with a sharp grinding instrument. In dentistry there is more and more focus on aesthetic finishing in restorations and fillings. The Viking Green Stone enables the user to have more control of the substance which is being removed. It is therefore perfect for fine adjustments and anatomic contouring (occlusal relief). It is also very well adapted for quick corrections and occlusion/articulation of prosthesis. The fine grit of the green stone makes the following high gloss polishing procedure very simple. Compared to a diamond bur the Viking green stone is safer to use (as it consists of many layers of a "brittle" material as opposed to a diamond bur, which has a solid and much more static grinding component). The mounted point will with the right pressure, work on the filling whilst not reducing or affecting the enamel (as opposed to the "rigid" capabilities of a diamond bur). This makes the bur perfect for handling the difficult point between filling and tooth. Extensive use of diamond burs for polishing restorations, damages enamel more than many may be aware of, is claimed by several field experts. In recent years we have been getting more and more of this feedback internationally.